The first Sanchez calves are on the ground and look good, come easy, are vigorous and have very respectable BW. Sanchez blends generations of Cobb Performance and Carcass Breeding with one of Canada's most noted cow families from the sparrow program. He is the sire of Diablo, the 2012 Denver Grand Champion, and Encore, the 2012 Fort Worth Grand Champion. 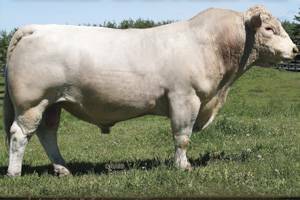 With 589 progeny in Canada, Sanchez is the proven outcross for your breeding program.